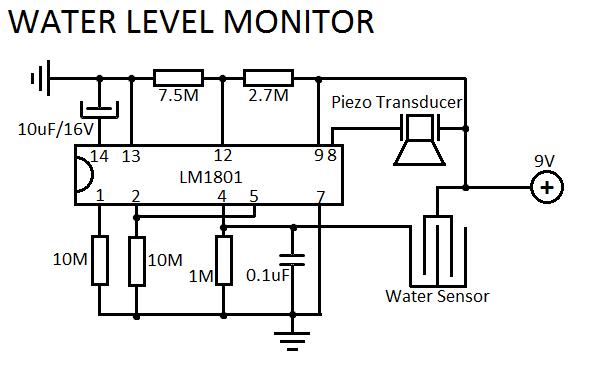 This simple water level sensor circuit monitors the presence of water in a certain location or container. The circuit sends an acoustic alarm when it senses a drop of water leak. It is very simple to build and it is made of a single IC and some passive components. Check out the water level indicator circuit too! The IC LM1801 is a low power comparator that can deliver high output current if needed. When water hits the sensor, the reference voltage is overshot and the IC drives the ceramic transducer to beep. 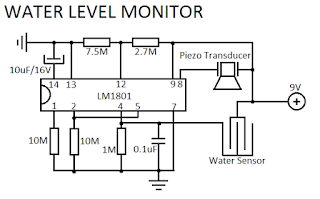 It is also possible to connect several sensors to the water level monitor circuit. The sensor can be easibly made out of a small piece of PCB that is etched with the proper pattern. The decoupling capacitor C3 is a 100uF/16V electrolytic capacitor.